Prior to completely revamping into Reflect Social Dining + Lounge, it was known as the Crystal Grille. 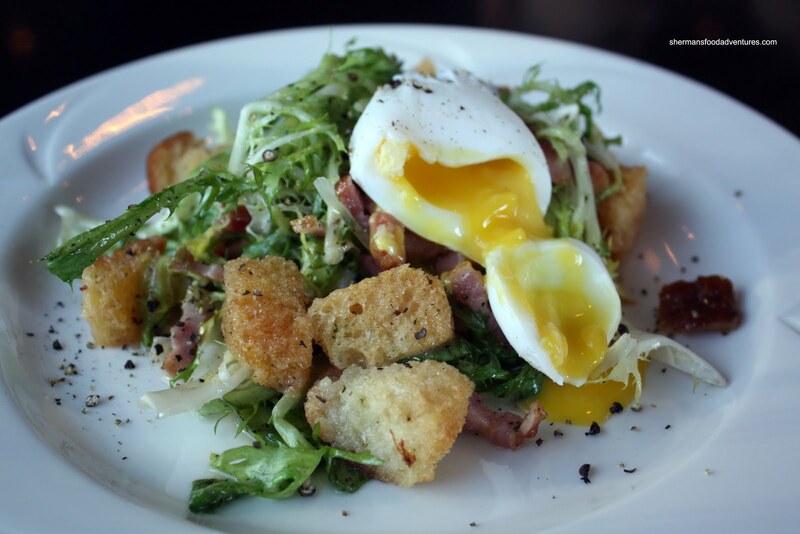 Known for its excellent Sunday buffet brunch, the dinner service lagged behind. In fact, my parents are frequent customers of this restaurant. We must've been to the brunch at least a half dozen times and dinner a few times. For me at least, dinner was a bust. Unrefined, inconsistent execution and poor value, there is no wonder that we'd be the only table at times. Of course, with any restaurant attached to a major hotel (Hilton in this case), it can be hit and miss. Now fully renovated with a new menu, Reflect attempts to right the wrongs of the Crystal Grille. Now with new dedicated buffet stations for their brunch, that is a good start. Originally, I made a reservation here for my mom's birthday not knowing it would be Dine Out week. On a side note, I find that with all the prix fixe menus these days, it totally takes the shine out of Dine Out. No matter, I stuck with the plan since we were bringing the kiddies with us. You see, trying to find a fine dining environment that will tolerate kids and offer a specialized menu is like trying to find a clean sidewalk in Chinatown. So we all ended up ordering from the Dine Out menu. There was actually a choice between $28.00 and $38.00 menus. Naturally, the better choices being from the more expensive one. Viv and my mom both had the $38.00 menu and started with the Smoked Duck Breast Salad with baby lettuce, lotus root chips and star anise vinaigrette. This sounded much better than what ended up on the plate. 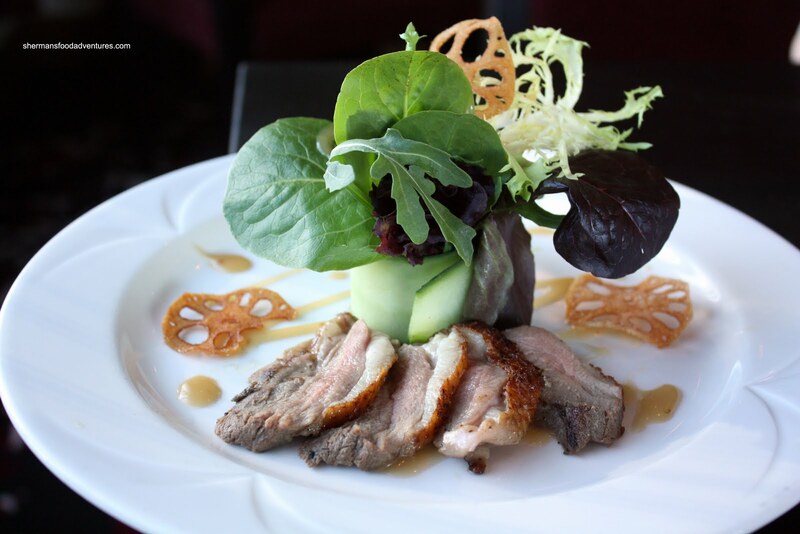 The duck did not look appetizing and neither did it do very well once they began to chew. It was quite tough and didn't exhibit much smoky flavour. The salad looked nice; but there was either too little dressing or it was just bland. I went for a favourite of mine - Frisee Salad with lardons, poached egg and vinaigrette. Starting with the positives, the poached egg was perfectly runny and the lardons were meaty and flavourful. However, the croutons were not crunchy at all; rather they were wet. More importantly, most of the frisee became wilted until they had no texture. Apparently the warm vinaigrette cooked it. Not good. 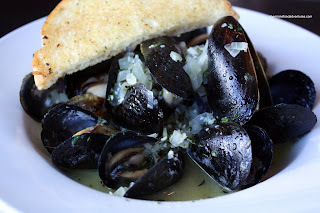 My dad started with the Steamed PEI Mussels with garlic, shallots, thyme and white wine. This was probably the best appetizer of the bunch with plump perfectly cooked mussels in a flavourful broth. Funny how there was no spoon provided to finish off the broth. I doubt that half piece of garlic bread? (not sure why that bread was used) would've sufficed. 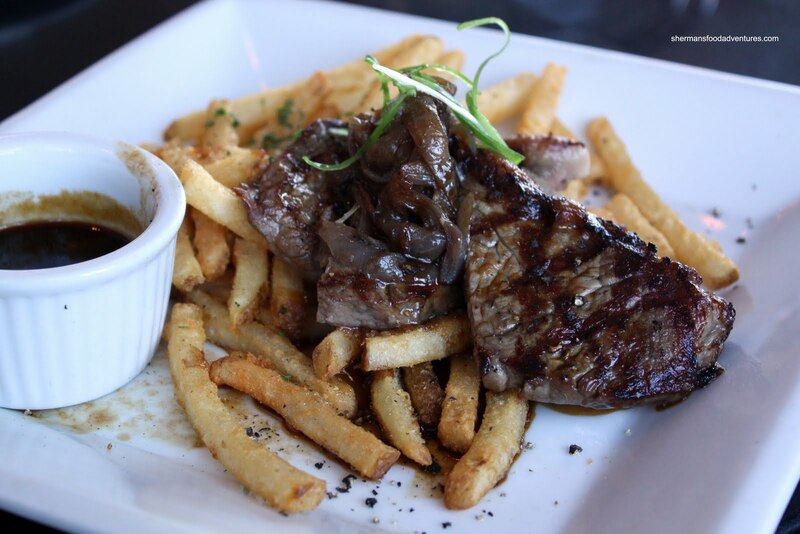 For my main, I decided on the Bistro Steak with caramelized onions, "traditional" pomme frites and merlot jus. I requested that my steak be done medium rare, closer to the rare side. What I ended up with was medium, closer to well done. 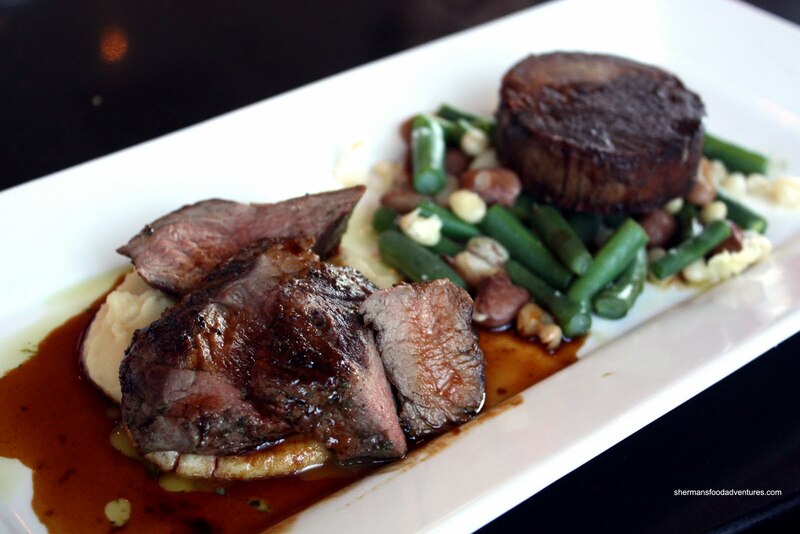 However, it was still quite tender while the merlot jus was rich and full of flavour. The biggest issue I had with this dish was the supposedly "traditional" pomme frites. Not sure about you, but to me, real pomme frites don't have a starch coating which are obviously of the frozen variety. If I were eating them at home, they would remarkably resemble those from Costco. Viv as always picked a tuna entree in the Sweet Ginger Glazed Albacore Tuna with shiitake-shemiji risotto, sesame spinach and wasabi tobiko butter sauce. This was actually a decent dish where the tuna was still rare in the middle with a light sauce. Didn't really taste the glaze though. 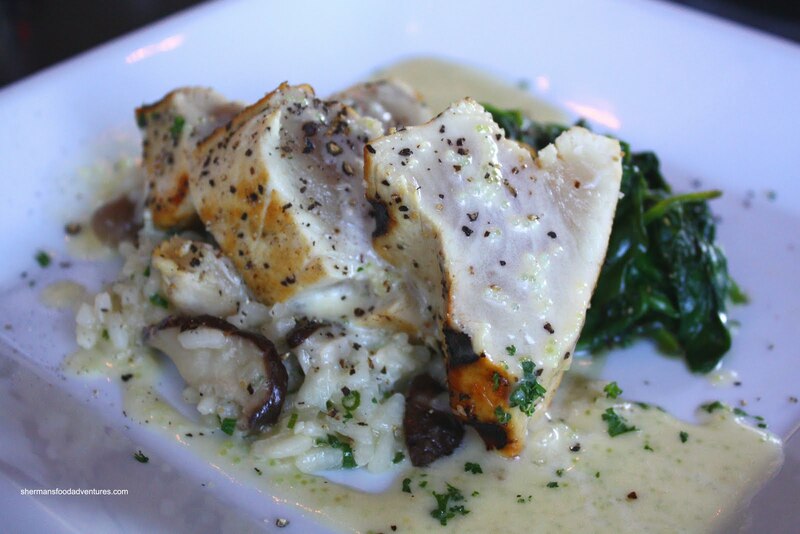 A real surprise was the risotto. It was good with perfectly cooked rice an an earthy creaminess. We hated the spinach though, it was limp and bitter. Since my mom loves lamb, it was a given she'd chose Duo of Lamb which consisted of lamb navarin with sautéed mixed beans and grilled lamb sirloin with white bean puree topped with a merlot jus. Although this dish was okay, it had issues as well. First, the lamb sirloin was a bit tough (it could've been more rare). Second, the lamb navarin was extremely dry and overcooked. The only saving grace was the excellent merlot jus, which I had with my steak. The white bean puree was excellent while the mi xed beans were not (plain and not tasty). 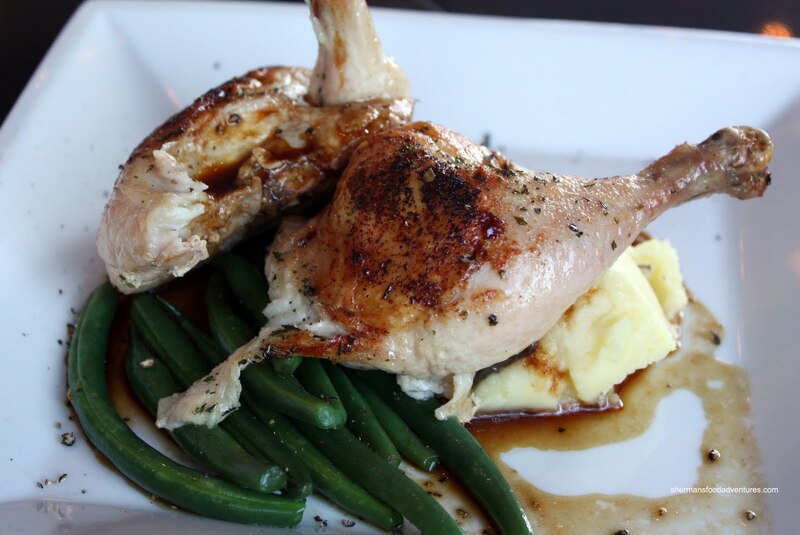 Trying to pick a healthier meal, my dad went for something quite boring with the Roasted Half-Chicken accompanied by Yukon mash potato and haricot vert. Predictably, it was ho-hum, although it was cooked perfectly being quite tender and juicy. The major problem with the dish was the lack of flavour. The chicken itself was not flavourful and the small amount of sauce didn't help. They should have either provided much more sauce (on the side) or marinade the chicken with stronger spices. Otherwise, the mash was creamy and the beans were cooked perfectly. 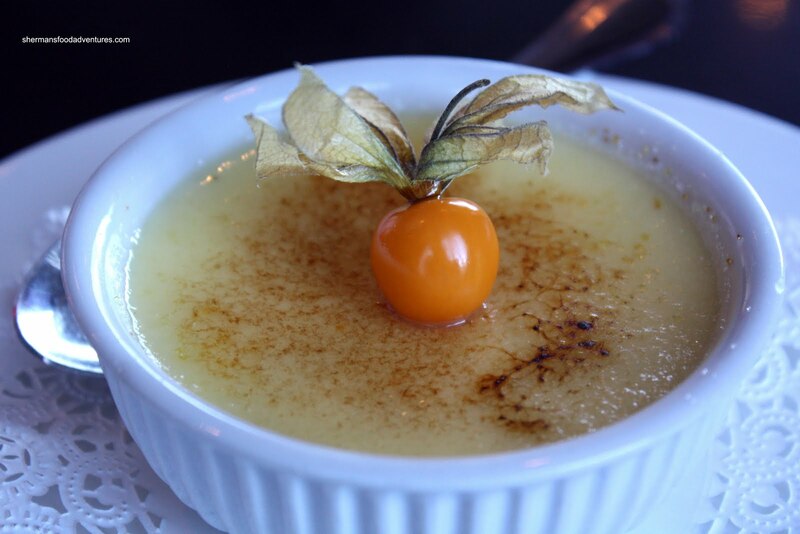 For dessert, my mom went with the Banana Vanilla Creme Brulee. As you can see in the picture, the top is sorely lacking colour. It could've stood for a bit more torching. However, it was still hard and nice to eat. The custard underneath was quite sweet while exhibiting a pretty silky texture. 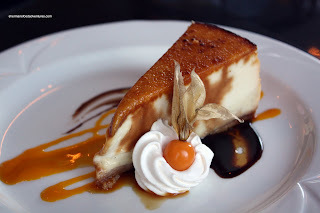 My dad went for the Creme Brulee Cheesecake and it was generally pretty good except for the brulee topping. We thought it was too gummy and sweet. I guess we can't knock it for being too sweet since it is made of sugar; but it should be at least crunchy right? Well, look closely, it wasn't. The cheesecake portion was excellent exhibiting a nice richness only achieved by being baked. Not too sweet and just the right consistency, it would have been great without the brulee. 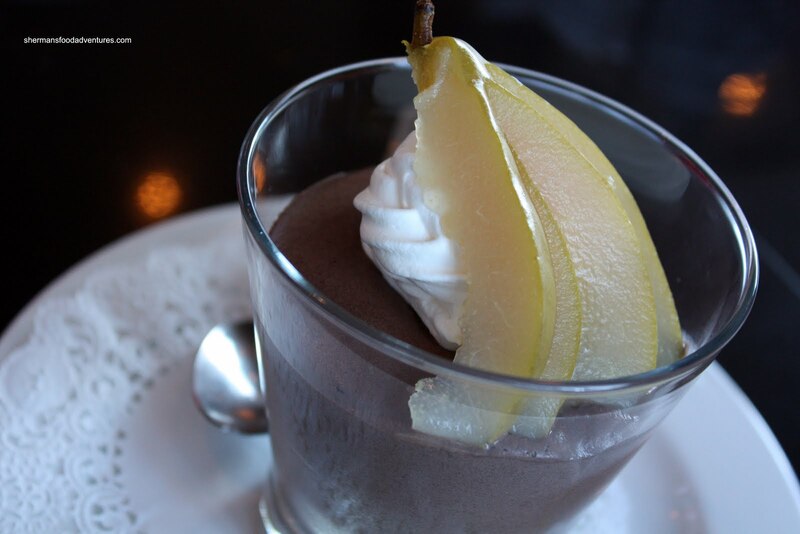 Viv went with the Belgium Dark Chocolate Mousse with cinnamon poached pear. We liked this mousse, it was light and only semi-sweet with some bitter aftertaste (which is good being dark chocolate). For my dessert, I had the Chocolate-Filled Soufflé which described on the menu as dense chocolate cake filled with chocolate ganache. Okay, either I've personally never had it this way before or a bundt-like cake can be considered a soufflé. 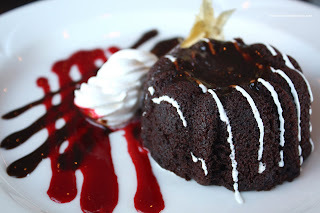 Essentially, I got a rich chocolate mini-bundt cake filled with chocolate ganache in the middle. If that was the intention, then my error; but I've never had a cake like this served in this manner. Other than the application, the dessert itself was not bad. Quite decadent and sweet though (which is the intention). 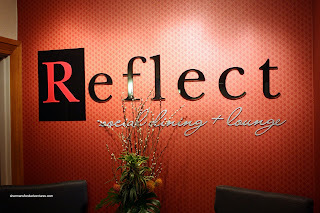 Alright, I have extremely mixed feelings about Reflect. I wanted to like it, I really do. After all, the former Crystal Grille was one of my parents regular places to eat (for brunch that is). For myself, I never really liked their dinner service and after the name change to Reflect, it hasn't changed my mind. It's not all bad, their brunch is probably one of the best values in town. However, for fine dining, the food here is too unrefined and full of execution issues. There were some highlights mixed in with plenty of problems. It's almost like they are trying to get there; but not quite. With so many fine dining options in Vancouver for the same cost and less, I find it hard to justify spending it at Reflect. Yah, presentation-wise, you probably can't tell with flavour and textures. With some tweaks, the food can be much better. But for the regular prices they charge, there shouldn't be those issues. For the most part, most fine dining establishments should not have so many issues since we have a certain level of expectations. Just too many problems with the food in general. you should try Cru on Broadway, i took my mom there on mother's day. overall, pretty good food and value.